SOUTHPORT, Ind. 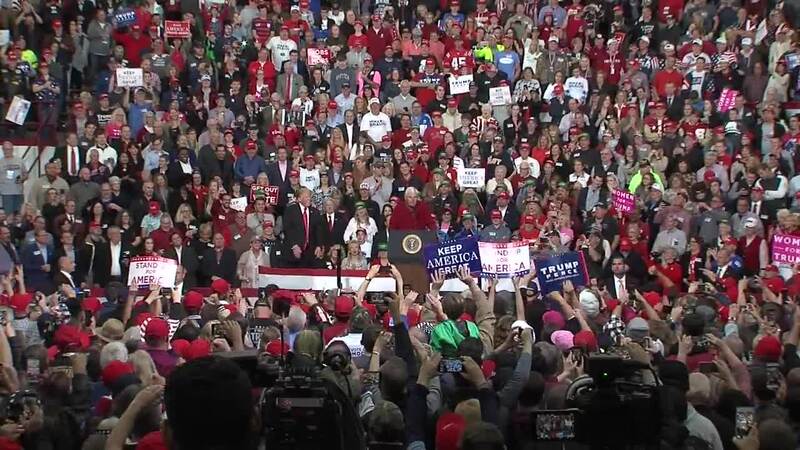 -- There didn’t appear to be an empty seat in the gymnasium at Southport High, where the crowd appeared thrilled that Trump had returned to Indiana with Hall of Fame basketball coach Bob Knight, a state legend, and Vice President Mike Pence, who was formerly the state’s governor. Trump recalled in great detail how Knight had reached out to him before he launched his campaign to encourage a run and how he’d magically found Knight’s number buried in a stack of papers on his desk months later. “That was from God,” Trump said. Trump held back-to-back campaign rallies Friday as he launched a feverish push to help elect Republicans in next week’s elections — but he also looked ahead to facing off against any of the Democratic “lefties” he expects to challenge his re-election effort in 2020. “I need you to vote for a Republican House and a Republican Senate so we can continue this incredible movement, the greatest political movement in the history of our country. It is.” — Trump on what’s at stake Tuesday. Trump opened a rally at an Indianapolis high school by highlighting the news from earlier in the day that the economy had added another 250,000 jobs in October. He also talked about the low unemployment rate. He didn’t single out any of the Democrats who are thought to be considering challenging Trump for the presidency in two years. At past rallies, Trump has named such Democrats as Sen. Cory Booker of New Jersey and Sen. Elizabeth Warren of Massachusetts, both considered possible 2020 contenders. “And they’re going to be saying what a good job they’re going to do by raising your taxes. You know, I think we’re going to win that debate,” Trump boasted. Trump came to Indiana to campaign for Republican Senate candidate Mike Braun, a former state representative and businessman who is putting up a stiff challenge to Democratic incumbent Joe Donnelly. Trump has sought at his rallies to leverage his popularity with his base supporters to help the GOP expand its slim 51-49 majority in the U.S. Senate. Trump said Donnelly, a first-term senator, was ineffective and referred to him as “Sleepy Joe.” While Donnelly has sought to highlight his cooperation with Trump on issues such as immigration, he voted against last year’s tax cuts and this year voted against Trump’s choice of Brett Kavanaugh to fill a vacancy on the U.S. Supreme Court. Trump has scheduled nine rallies in West Virginia, Indiana, Montana, Florida, Georgia, Tennessee, Ohio and Missouri between Friday and Election Day. The Indiana event received an added boost from Vice President Mike Pence, who represented Indiana in Congress and as governor, and Bobby Knight, the Hall of Fame former head coach of the Indiana University men’s basketball team. Trump said critics had given him a “hard time” about the video, which featured a Mexican migrant in a courtroom, smiling and boasting about having killed police officers. The video alleges without evidence that Democrats were responsible for allowing Luis Bracamontes into the U.S. The twice-deported immigrant from Mexico was sentenced to death in California for the 2014 killings of two police officers. The video also includes scenes of a migrant caravan that is moving toward the U.S., but is still hundreds of miles away from the border. It ominously warns, “Who else would Democrats let in?” and suggests more violence will soon penetrate the border. Trump’s aggressive travel schedule over the next several days is aimed at boosting GOP Senate candidates as the party tries to expand its Senate majority, rather than working to defend embattled Republicans in the House, where the party’s control appears in doubt. In West Virginia, Trump campaigned for Republican Attorney General Patrick Morrisey, who is in a tight race against Democratic Sen. Joe Manchin. Trump told several hundred people cheering him from inside the airport hangar that a vote for Manchin is a vote for Sen. Chuck Schumer, the leader of Senate Democrats and Trump’s fellow New Yorker. Trump didn’t present a complete picture of Manchin’s voting record. On major issues, Manchin did join Democrats in voting against tax cuts that Trump signed into law last year, but he broke with his Democratic colleagues and voted for both of Trump’s Supreme Court nominees: Neil Gorsuch and Brett Kavanaugh. Trump has been using his campaign rallies to warn his Republican base of what he argues are the negative consequences of Democratic control of Congress. He has been stoking GOP anger over the Democrats’ handling of Kavanaugh’s confirmation hearings and fears of illegal immigration as the migrant caravan slowly advances toward the U.S.-Mexico border. The final push comes as more than 30 million Americans have already cast ballots for Tuesday’s midterm elections. The White House revealed Friday that Trump and first lady Melania Trump have already voted. Press secretary Sarah Sanders confirmed that the pair voted by absentee ballot “a few weeks ago” in New York, where their primary residence is located. The White House did not reveal for whom the Trumps cast ballots. New York’s Democratic Gov. Andrew Cuomo is facing Republican Marc Molinaro in the governor’s race. Democratic Rep. Carolyn Maloney is opposed by Republican Eliot Rabin in the heavily Democratic 12th Congressional District in New York City. New York law allows absentee voting only under particular circumstances, including absence on Election Day or illness.